Recession proof fashion? Is there such a thing? It seems in these uncertain times retailers are looking for that key brand that ticks all the boxes. A fashion label that gets them good sell through, as well as a bit of volume. And it appears there is a label defying gravity in terms of sales for retailers. And, it’s a label which can have a rather polarizing effect. Quite frankly, you either love it or hate it. The label in question is none other than, Black Pepper. Phoebe Garland co-owns Garland & Garland Fashion, with Robert Garland who was described by Ragtrader as a “veteran rag trader” with over 30 years experience in the fashion industry. Between the two of them, Phoebe & Robert Garland have over 45 years sales experience. Garland & Garland Fashion is a leading fashion agency based in Sydney and they are regularly sought for comment from various media on business fashion topics and issues. Black Pepper is one of those labels you have to have respect for the strength of sales it does in the market. And more importantly the sales it achieves for retailers. Volume is its key strength and its demand from customers would have some of the more glamorous higher end labels sit up and take note out of pure envy. Black Pepperhas evolved drastically over the years. Its traditional heritage was mainly track suits and fleece, but these days the label brings a much more fashionable element in the ranges. So much so, it’s now attracting a higher-end boutique clientele. These types of boutiques are now starting to stock the label due to sheer demand from customers which attributes to the brands strong loyalty. In a nutshell, its brand loyalty is so strong; it’s like “Chanel” for the older demographic. The fashion pieces offer a `good value for money component’ to sit alongside higher end labels. More importantly, it’s a brand that has a very strong following. Black Pepper is known for its excellent value for money, which ensures a strong sell-through for retailers without having to discount, which is always appealing. Whilst there will always remain its core pieces of fleece and tracksuit in Black Pepper, the company Breakaway Apparel, now part of The PAS Group, works hard to ensure it will appeal to the next generation down, to keep the brand loyalty strong and is moving forward and constantly developing the fashion component. Gordon Black founded Breakaway in Melbourne in 1976. Gordon was and still is a fanatical Rugby follower. He played first grade Rugby Union until he was 36 years old, playing against the likes of South Africa and the All Blacks. He played in the Breakaway position, hence the company name. The company specialises in leisurewear with several leading brands under its belt; Yvonne Black, Breakaway Menswear, Equus and the recently acquired Yarra Trail. Black Pepper was its founding brand, and it recently celebrated 30 years in business. In 2010, Breakaway customer service beat Mercedes- Benz in the Australian Business Awards with Matt Lawson, head of customer service heading up the team. I spoke to C.E.O of Breakaway, Olav Uittenbosch about the success of Black Pepper and why it’s such a leading brand. Olav, Why do you think the label has been such a success? O.U: We know our customer very well and constantly engage with her via market research, focus groups, or in-store interaction and observations. We translate all this knowledge into a product range that speaks to our customer; it looks/feels/fits/handles right, and all at price points that represent good value. Breakaway has been crafting Black Pepper for over 30 years and has always focused on this market segment and stuck to it. As the brand has grown it has created its own success as it got access to better financial resources that could be reinvested into the brand to further improve the garment and expand the business and recruit the best people in the business. The team at Breakaway is like a family and it is a great environment to work in. All of these together help to keep creating strong ranges that keep growing. PG: Where do you see Black Pepper’s growth in the future considering it’s main audience is elderly? Will there be a move to target the next generation down? O.U: We constantly ensure that we have a part of the range that caters for the next generation down. This way we ensure that we keep introducing new customers into our Black Pepper range. Most of our international media and marketing campaigns are targeted at this segment so we keep introducing the brand to new customers. This is way we are still around and growing strongly after 35 years. PG: What makes this a “recession proof” brand and a brand that is in such high demand from customers? O.U: The older customer segment is a fastest growing segment of the population, which in itself already provides growth for Black Pepper. We continuously introduce new details, fabrics and styles and are looking for ways on how we can do things better than last time. We remain loyal to our customer and ensure that we meet expectations while at the same time trying to over deliver on product promise. This might be via the lifetime of the garments, the ease of washing, soft handling, hidden pockets and reinforced stitching, etc. PG: Will there be an international expansion of the label? O.U: We have had no need to look for further growth outside of our current distribution in Australia, and New Zealand. We have however been approached by a distributor in South Africa, and we have seen very strong growth of our brands there. While Olav has provided such an insight into such a commercially astute brand, there is one retailer that needs to be highlighted as a key retailer of the season. Patricia McGrath, owner of Frantik Boutique in Springwood is a retailer who has in the past year started stocking Black Pepper. Frantik was initially stocking medium to higher end brands, however she attributes Black Pepper to saving her business. We ask Patricia how she has found stocking Black Pepper among her higher end labels. P.G: How has the Black Pepper label changed your retail sales in comparison to the other higher end brands you were putting in? P.M: At first I was a little nervous about introducing Black Pepper, I was happy sticking to my tried and tested medium to high end brands. Now when I look back, I can honestly say that introducingBlack Pepper was one of the best business decisions I have made to date. A new type of buyer has started to come to our store, a buyer that isn’t afraid of spending money and who seems to be addicted toBlack Pepper! Our more expensive brands are still selling but not at the same speed or large quantities as Black Pepper. P.G: Do you have to mark down Black Pepper and do you get good sell through? P.M: I have a standard sale at the end of every season where I mark the store down between 20-30% but I find that by the time I get to sale time, I’ve sold out of most of my Black Pepper so I don’t have much to mark down. P.G Considering your store’s profile was upmarket and somewhat younger, how have you found Black Pepper has fitted in? P.M: Absolutely! Black Pepper isn’t what you think; some of my best customers who generally stick to my European brands have started buying core pieces in the range. P. G: As a percentage how much has your sales increased since you put Black Pepper in? P.M: In terms of figures, I’d say sales have increased 20%. I honestly think that Black Pepper has ensured my business survival since I introduced it to the store. Like Frantik Boutique, evolution seems to be the way forBlack Pepper label. Expect the brand to live on for another 30 years… like fine wine…it will only be getting better with age. 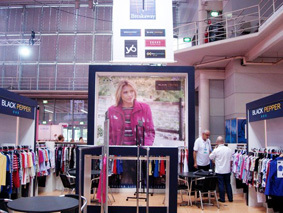 Black Pepper exhibits at Fashion Exposed on the Breakaway Apparel Stand alongside their other labels; Yvonne Black, Breakaway Menswear, Equus and Yarra Trail in Sydney and Melbourne each year. It is available for viewing in between seasons through each of their fashion agents in each state. To make an appointment to see the Black Pepper range call Australia Freecall: 1800 001 399 or visit their website. As always very interested in your thoughts.